I came across a story in an email recently and thought you might enjoy it. The preacher placed two identical jars on the table next to the pulpit. He quoted 1 Samuel 16:7 'The Lord does not look at the things man looks at. Man looks at the outward appearance, but the Lord looks at the heart." "These jars came from the same factory, were made of the same materials, and can hold the same amount. But they are different," he explained. Then he upset one of the jars and it oozed out honey. He turned over the other jar, and vinegar spilled out. "When a jar is upset, whatever is in it comes out. Until the jars were upset, they looked alike. The difference was within, and could not be seen. When they were upset, their contents were revealed. Until we are upset we put on a good front. But when we are upset, we reveal our innermost thoughts and attitudes, for "out of the abundance of the heart his mouth speaks' ( Luke 6:45)"
What if someone tipped you over today ?? What would flow out ?? Would you reveal the "honey" of grace and patience, or the "vinegar" of anger and sarcasm ?? "Above all, love each other deeply, because love covers over a multitude of sins" . crochet family after his accident and during his recovery process. causing multiple injuries which took months to overcome. I mentioned recently about our newest "furry" addition named Riley. Just like children, they each have a unique personality. I am making a Mermaid Tail and came across this direction (ch2, dc 2, 2dc). I understand the 2 chain, but what does the next direction tell me? These instructions seem a bit confusing... when instructions are enclosed within parentheses you should be instructed where to work said instructions directly after the closing parenthesis. Do not fret because of evildoers, be not envious toward wrongdoers. For they will wither quickly like the grass, and fade like the green herb. Trust in the Lord, and do good; dwell in the land and cultivate faithfulness. Delight yourself in the Lord; and He will give you the desires of your heart. Commit your way to the Lord, trust also in Him, and He will do it. And He will bring forth your righteousness as the light. And your judgment as the noonday. Rest in the Lord and wait patiently for Him; do not fret because of him who propers in his way, because of the man who carries out wicked schemes. Cease from anger, and forsake wrath; do not fret, it leads only to evildoing. For evildors will be cut off, but those who wait for the Lord, they will inherit the land. Yet a little while and the wicked man will be no more; and you will look carefully for his place, and he will not be there. But the humble will inherit the land, and will delight themselves in abundant prosperity. At that time Jesus answered and said, "I praise Thee, O Father, Lord of heaven and earth, that Thou didst hide these things from the wise and intelligent and dist reveal them to babes. Yes, Father, for thus it was well-pleasing in Thy sight. All things have been handed over to Me by My Father; and no one knows the Son, except the Father; nor does anyone know the Father, except the Son, and anyone to whom the Son wills to reveal Him. Come to Me, all who are weary and heavy-laden and I will give you rest. Take My yoke upon you, and learn from Me, for I am gentle and humble in heart; and YOU SHALL FIND REST FOR YOUR SOULS. For My yoke is easy, and My load is light. Now when Jesus heard it, He withdrew from there in a boat, to a lonely place by Himself; and when the multitudes heard of this, they followed Him on foot from the cities. Jesus, therefore, six days before the Passover, came to Bethany where Lazarus was, whom Jesus had raised from the dead. So they made Him a supper there, and Martha was serving; but Lazarus was one of those reclining at the table with Him. Mary therefore took a pound of very costly perfume of pure nard, and anointed the feet of Jesus, and wiped His feet with her hair; and the house was filled with the fragrance of the perfume. ALLOWS YOU TO LISTEN CAREFULLY TO GOD." Who was the wife of Herod's brother, Philip? 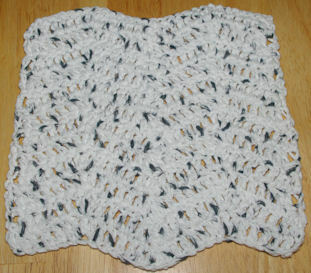 Gauge refers to the measurement of stitches and rows contained in a stitch pattern sample. 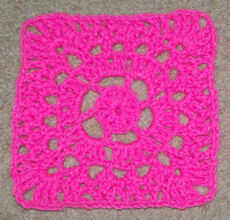 Always begin your gauge swatch with the recommended hook size and yarn then adjust the hook size as needed. Be sure to make your swatch large enough to get a proper measurement. To measure the stitch gauge... lay the ruler horizontally across the work. Row gauge... lay the ruler vertically across the work. Keep in mind... if your project isn't for a garment or an item that needs to be the approximate suggested size in the pattern instructions... then checking the gauge isn't as critical. 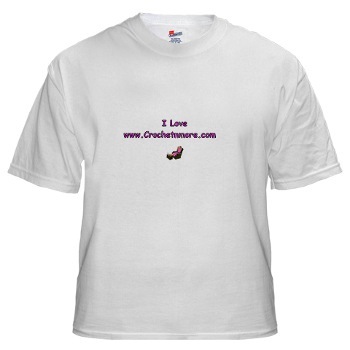 There are tons of free crochet patterns online. When you find a pattern you like it's a good idea to add a bookmark to the webpage in order to locate it again in the future. Keep in mind that websites come and go continuously and you may find that a pattern you bookmarked has disappeared. When possible, go ahead and print that pattern. If you do not have a printer you can use a printer service at your local library. Yes, tr is a treble or triple crochet. How do I not turn the project and still do my rows? When a project says "do not turn" it will either be worked in rounds or it will use stitches that go in the opposite direction like the Reverse Single Crochet. To which project are you referring? Thank you... not sure why this video series had volume issues. Hopefully I can make a new series eventually. Hope you enjoyed the pattern (link below the video). I'm looking for a simple, easy. 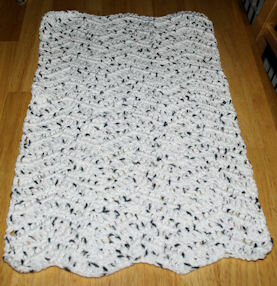 And quick blanket, with the same stitch, in order to make for shelter pets- dogs and cats. Can you suggest one with instructions? Thanks for the pattern. Please let me know how to make them bigger for a 2 year old girl. (feet length = 51/2"). I do not currently have sizing instructions to enlarge this pattern. I will keep that on my list of future projects. Excellent. What is the best hook for Bernat blanket yarn? 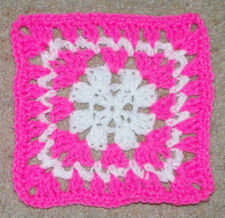 I want to make a granny square solid color blanket. Looks like I will need a lot of yarn to complete. This yarn is so soft. Saw it in Michaels while looking for yarn needle. Yarn labels include a recommended hook size on the label. However, this is only a guide. Bernat Blanket Yarn is considered a bulky yarn and lists a size K hook. Feel free to use any hook size you feel yields the best looking project. Bulky yarns yield larger stitches than worsted weight yarns so your project will be on a larger scale which will require fewer stitches to achieve the needed size. I didn't list the yarn amount on the pattern since the length is adjustable. I use the runner I made on my sewing table. The size is 10-1/2" x 32". For that size I used approximately 5 ounces of yarn. It's been a while since i have emailed you to let you know that you are such a blessing to a lot of people. My Wednesday night bible study folks want not only to be fed the Word... but would like to learn to crochet as well. I hope you don't mind me sharing the news letter with the folks on Facebook. is such a pleasure to wander through. I'm glad you enjoy my website. I appreciate when you share my website/newsletter with your friends. I hope your Wednesday night bible study members have enjoyed the information we offer also. I receive so many emails and social media messages that it takes me a while to respond. Thanks for a nice pattern. At the end of my factory shift, I was asked to purchase some supplies. The machines' conveyor belts needed talcum powder to prevent them from sticking, and we had run out of aspirin for workers with noise-induced tension headaches. I drove to the nearest store and loaded a shopping cart with four cases of baby powder and several boxes of aspirin. As the man behind me in the checkout line peered at my purchases, he laughed and exclaimed, "Must be one heck of a kid!" One furniture shop drew shoppers to a big sale by offering a free recliner to the laziest attendee. "Will all lazy folk come forward?" the organizer asked. He was instantly declared the winner. I spent more than two hours in the beauty shop getting my hair permed, cut and styled. Relieved to be done, I went up to the receptionist to pay. "Good afternoon!" 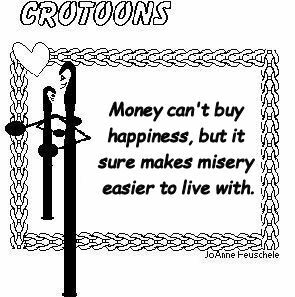 she said cheerfully. "And who's your appointment with today?" When they were at Sea World in Florida Natalie was fascinated by the roller coaster and all its screaming passengers. Matt asked her if she'd like to go on the roller coaster, and she said no, it would be too scary. "Would you go on it with Daddy?" Matt asked. "Maybe... MAYBE if Jesus came with me I'd ride on it!" Three mice were being chased by a cat. The mice were cornered when one of the mice turned around and barked, "Ruff! Ruff! Ruff!" The surprised cat ran away scared. Later when the mice told their mother what happened, she smiled and said, "You see, it pays to be bilingual!" Pupil: "Teacher, can a fellow be punished for something he hasn't done?" Pupil: "That's good, because I haven't done my homework." Our nephew was getting married to a doctor's daughter. At the wedding reception, the father of the bride stood to read his toast, which he had scribbled on a prescription pad. "I'm really sorry, folks. I can't seem to make out what I've written down." Looking out into the audience, he asked, "Is there a pharmacist in the house?" So I got my doctor's permission to join a fitness club and start exercising. I decided to take an aerobics class for seniors. I bent, twisted, gyrated, jumped up and down, and perspired for an hour. But by the time I got my leotards on, the class was over. We were doing a science lesson on how plants grow. The children all got a chance to plant their own seeds. After a few days of watching the seedlings, I secretly exchanged a few seeds for the children whose plants did not sprout. Several days later one of my students said: "Look Mrs. Gilligan, it's a miracle, my plant is growing". I said: "Yes, seeds sprouting is very exciting". He said: "No Mrs. Gilligan, that's not the miracle, I ATE the SEED and it is growing anyway!" The attendant worked quickly, but there were many cars ahead of him in front of the service station. Finally, the attendant motioned him toward a vacant pump. "Sorry about the delay. It seems as if everyone waits until the last minute to get ready for a long trip." One day a little girl was sitting and watching her mother do the dishes at the kitchen sink. She suddenly noticed that her mother has several strands of white hair sticking out in contrast on her brunette head. She looked at her mother and inquisitively asked, "Why are some of your hairs white, Mom?" You got to find somebody who likes the same stuff. Like, if you like sports, she should like it that you like sports, and she should keep the chips and dip coming.